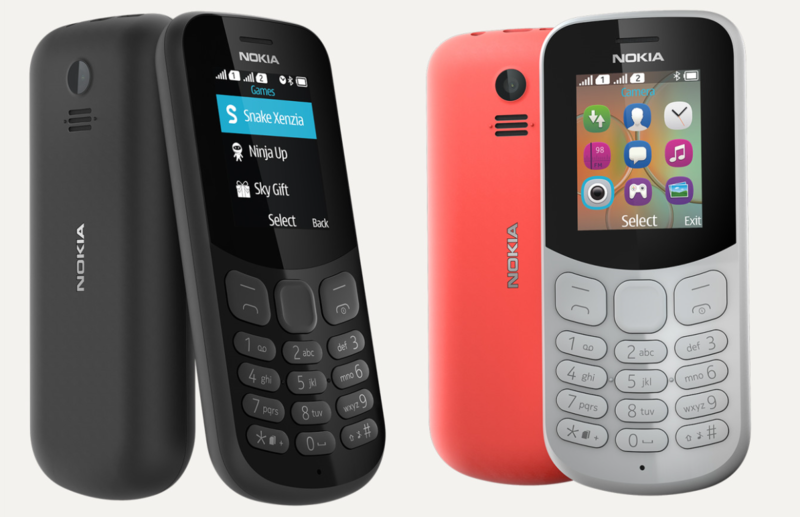 HMD Global announced two new members of the Nokia feature phone family, the all new Nokia 105 and the all new Nokia 130. The new Nokia 105 is the successor to the most affordable Nokia feature phone, that received few hardware updates since launch. 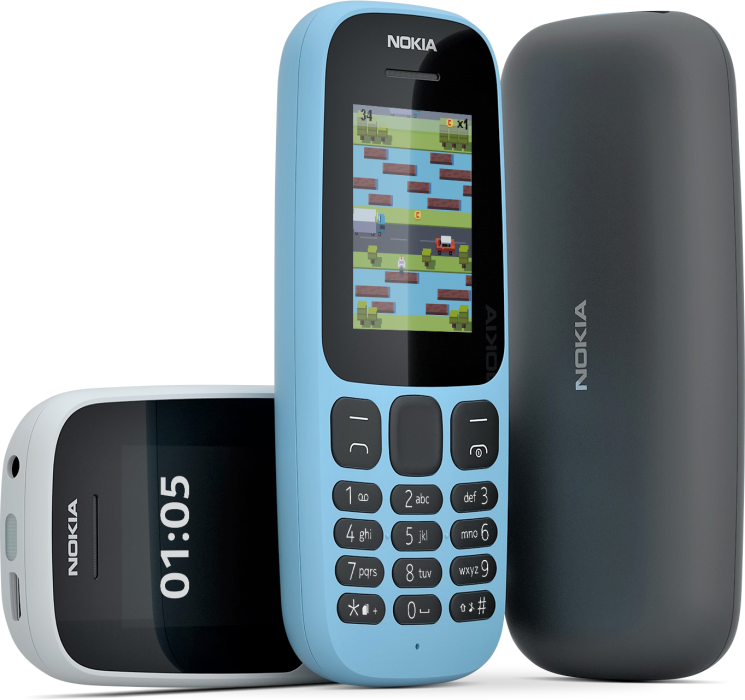 The last year’s Nokia 105 is now called “Nokia 105 Classic”, to make a difference from the new Nokia 105. The Nokia 105 series sold over 200 million units since hitting the market in 2013. Nokia 105 comes with a classic, ergonomic all-plastic body, looking really nice for a feature phone and sharing some design lines from the new 3310. After a quick glance, it’s obvious that the device follows the famous “Fabula” design principle Nokia established in 2011, because the device is clean, with no extra elements on the housing. Actually, it’s so clean that it doesn’t have a camera, just like the 105 Classic, to keep the price down. The device is 112.0 x 49.5 x 14.4mm in size, weighing just 73g, including the battery. The front is dominated by a 1.8-inch screen with QQVGA resolution (128×128 or 128×160), which is bigger than the 1.4-inch display on the 105 Classic. The device will come with 2 different GSM bands: 900/1800 for EU (and rest of the world) and 850/1900 for the US. Nokia 105 runs the Nokia S30+ OS, with 4MB RAM and 4MB of internal storage. The battery is removable and has the capacity of 800mAh, that will be enough for up to 15 hours of talk time. The phone is charged via a MicroUSB2.0 port and uses Mini-SIM. A 3.5mm headphone jack and FM Radio are included as well. Snake Xenzia comes pre-loaded on the phone, but there are other games, like Doodle Jump, that can be downloaded as well. Connectivity standard used is 2(.5)G, and the device also has a flash on the top. It will be offered in three colors: white, black and blue. The device will retail for €12.65 ($14.50) for the Single SIM and €13 ($15) for the Dual-SIM variant, excluding taxes. We are still expecting the official press release from HMD and we will include it in the article once it’s out. In the mean time, you can check the official Nokia site for more info about the new Nokia 105. Alongside with the new Nokia 105, the all new Nokia 130 appeared on the official Nokia site. The new 130 is not officially announced, but the product page is up on Nokia.com. The same as with the old 105, the old Nokia 130 now carries the name “Nokia 130 Classic”. The new 130 comes in a polycarbonate shell, that keeps the color even when scratched, because it has multiple layers of color, just like the old Lumia devices. The size of the phone is 111.5×48.4×14.2mm, and the only bands available are GSM 900/1800 (EU). The phone runs on Nokia S30+ OS, using 4MB of RAM and offering 8MB of internal storage, expandable via MicroSD card. The display is the same 1.8-inch one as on the new Nokia 105, but the new 130 also features a camera. It has a built-in FM Radio and MP3 player, also a 3.5mm headphone jack. The 1020mAh removable battery can last up to 44 hours of listening FM Radio, and has a one month standby time. It comes pre-loaded with Snake, and five demo version of popular Gameloft games that can be purchased after trying. It will be available in three colors: white, Black and red, retailing for €18.80 ($21.50) before taxes. The spec sheet and the official product page are not complete, and HMD probably went a little early on making the 130 product page go live. We will update the article with more info about the new Nokia 130 and with press releases once it’s all out. EMBARGOED UNTIL 7:00AM EEST 17 July 2017: HMD Global, the home of Nokia phones, today announced the dual release of both the Nokia 105 and Nokia 130. Featuring refreshed, ergonomic designs, both phones come packed with fantastic features, effortlessly combining reliability and excellent value and durability. Both models feature 1.8-inch colour screens, handy LED torch lights and sleek, contoured designs, with each phone being available in a range of three colours. With more than 1.3 billion feature phone users around the world, many from markets in Asia and Africa, the reliability and excellent value that both the Nokia 105 and Nokia 130 offer is set to ensure yet more people around the world can get connected. The new keymat features separated keys for improved usability, while the larger 1.8-inch screen delivers a better viewing experience when playing your favourite games, like Snake Xenzia, which comes preloaded. Taking full advantage of the larger screen, the Nokia 105 also comes preloaded with two try and buy games – Doodle Jump and Crossy Road. Plus, with up to 15 hours[iii] talk time and a month long standby, the Nokia 105 lets you talk from sunrise to sunset on just one charge. And with enough storage space for up to 500 text messages and up to 2,000 contacts, you’ll always be able to stay connected. Available in Dual and Single SIM variants, the Nokia 105 also features an inbuilt FM Radio and charges using a standard Micro USB cable (USB 2.0). No matter where you are or what you’re doing, music makes life a lot more fun. With up to 44 hours of FM radio playback time and room for thousands of songs when you add up to 32GB of MicroSD card storage, the Nokia 130 ensures you’ll always have the right track for the moment. If video is your thing, the clear 1.8-inch colour screen offers a great viewing experience when enjoying video via a MicroSD card. And with 11.5 hours of video playback on a single charge, you can turn free time into entertainment time. The Nokia 130 features Bluetooth support for a headset or speakers – perfect for wireless listening to your favourite playlist on the go. With its inbuilt camera, the Nokia 130 lets you take pictures and record video clips, which you can then play back using a MicroSD card. And with the Nokia 130, sharing your content is simple. Share videos, contacts and more simply by enabling Bluetooth and bringing your Nokia 130 close to another Bluetooth-enabled phone for quick and easy transfer. The Nokia 130 also supports a MicroSD card, expandable up to 32 GB. “With more than 4 billion people remaining offline and unable to benefit from the social and economic development opportunities of the internet, simply getting connected by voice and text is still such an important step for many people around the world,” commented Arto Nummela, CEO, HMD Global. 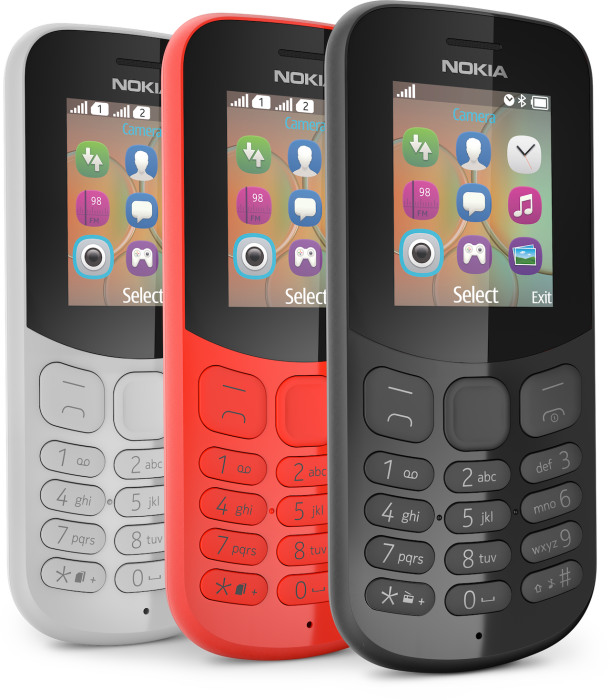 Both the Nokia 105 and the Nokia 130 feature the ever popular LED torchlight – simply press the up key twice to quickly turn the torch on and off. 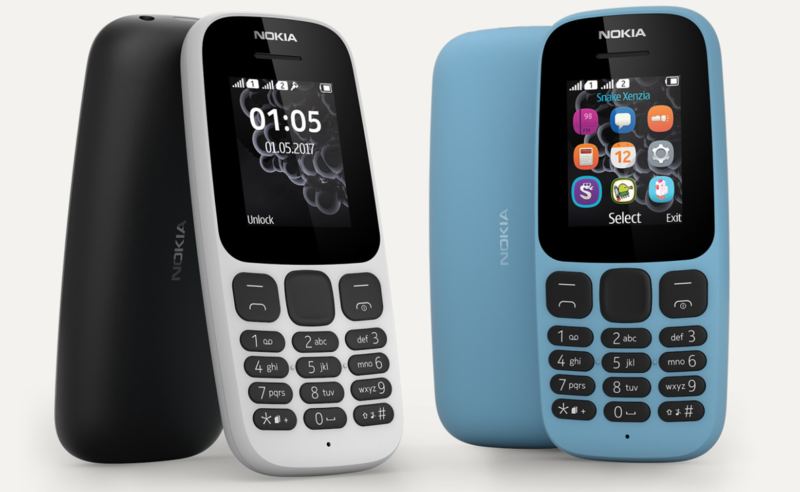 Retailing at a global average price of $14.50 for the single SIM variant and $15 for the dual SIM variant, excluding taxes and subsidies, the Nokia 105 will be available in blue, white and black – each colour with a matte finish. Both the Nokia 130 and Nokia 105 are available in Dual and Single SIM variants. Update: The new devices will go on sale starting 19th July.